One of the Brothers Grimm fairy tales, Allerleirauh. In Dutch the title of this story is Bontepels, in English All-Kinds-of-Fur, sometimes translated as Thousandfurs. The three dresses in this story had stuck with me. I did search for a moon dress this Monday morning. 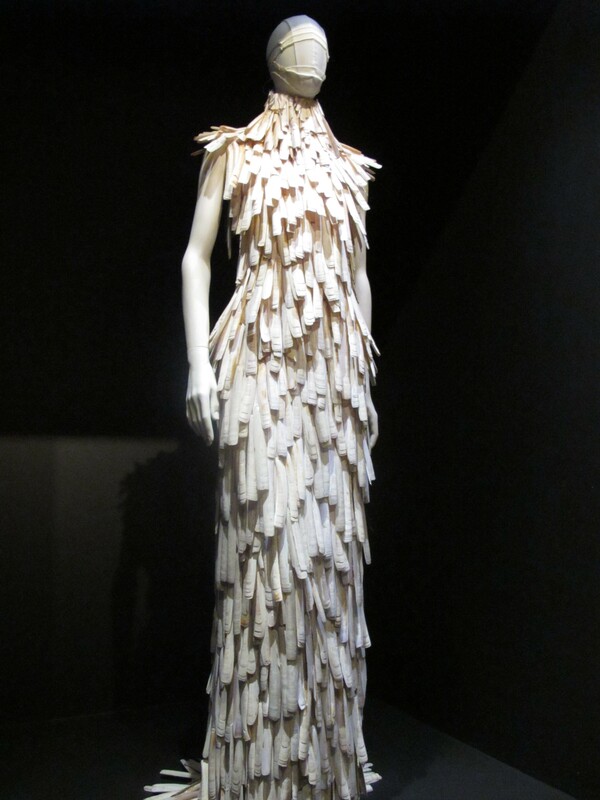 I came across an Alexander McQueen dress. Beautiful. I also found a lovely golden dress and one which to me resembles a star in a way, both from McQueen as well. The mantle of a thousand different kinds of fur i didn’t find. 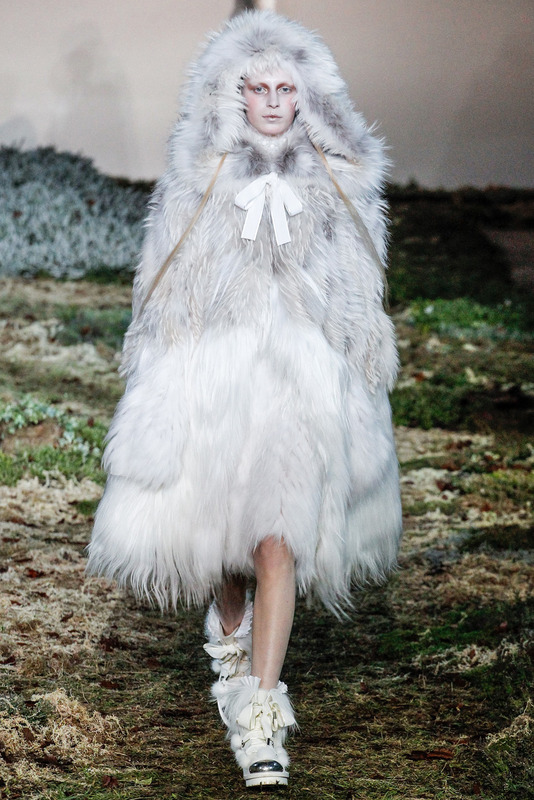 But another fur mantle did pop up which looks lovely. 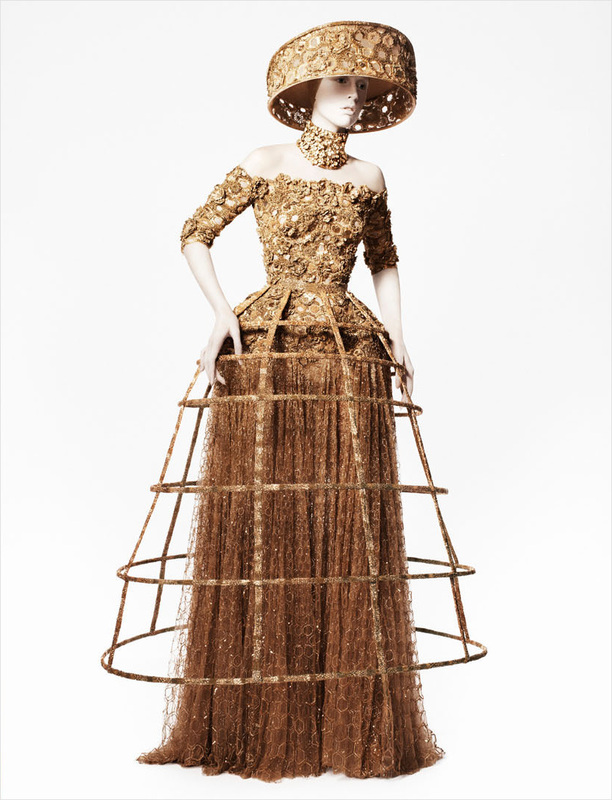 In another post i will dive deeper into McQueen’s work. You may read the fairy tale Allerleirauh here, and listen to me reading this aloud. Enjoy! Now the King had a daughter, who was just as beautiful as her dead mother, and had the same golden hair. When she was grown up the King looked at her one day, and saw that in every respect she was like his late wife, and suddenly felt a violent love for her. Then he spake to his councillors, “I will marry my daughter, for she is the counterpart of my late wife, otherwise I can find no bride who resembles her.” When the councillors heard that, they were shocked, and said, “God has forbidden a father to marry his daughter, no good can come from such a crime, and the kingdom will be involved in the ruin.” The daughter was still more shocked when she became aware of her father’s resolution, but hoped to turn him from his design. Then she said to him, “Before I fulfil your wish, I must have three dresses, one as golden as the sun, one as silvery as the moon, and one as bright as the stars; besides this, I wish for a mantle of a thousand different kinds of fur and hair joined together, and one of every kind of animal in your kingdom must give a piece of his skin for it.” But she thought, “To get that will be quite impossible, and thus I shall divert my father from his wicked intentions.” The King, however, did not give it up, and the cleverest maidens in his kingdom had to weave the three dresses, one as golden as the sun, one as silvery as the moon, and one as bright as the stars, and his huntsmen had to catch one of every kind of animal in the whole of his kingdom, and take from it a piece of its skin, and out of these was made a mantle of a thousand different kinds of fur. At length, when all was ready, the King caused the mantle to be brought, spread it out before her, and said, “The wedding shall be to-morrow.” . When, therefore, the King’s daughter saw that there was no longer any hope of turning her father’s heart, she resolved to run away from him. In the night whilst every one was asleep, she got up, and took three different things from her treasures, a golden ring, a golden spinning-wheel, and a golden reel. The three dresses of the sun, moon, and stars she put into a nutshell, put on her mantle of all kinds of fur, and blackened her face and hands with soot. Then she commended herself to God, and went away, and walked the whole night until she reached a great forest. And as she was tired, she got into a hollow tree, and fell asleep. Allerleirauh lived there for a long time in great wretchedness. Alas, fair princess, what is to become of thee now! It happened, however, that one day a feast was held in the palace, and she said to the cook, “May I go up-stairs for a while, and look on? I will place myself outside the door.” The cook answered, “Yes, go, but you must be back here in half-an-hour to sweep the hearth.” Then she took her oil-lamp, went into her den, put off her fur-dress, and washed the soot off her face and hands, so that her full beauty once more came to light. And she opened the nut, and took out her dress which shone like the sun, and when she had done that she went up to the festival, and every one made way for her, for no one knew her, and thought no otherwise than that she was a king’s daughter. The King came to meet her, gave his hand to her, and danced with her, and thought in his heart, “My eyes have never yet seen any one so beautiful!” When the dance was over she curtsied, and when the King looked round again she had vanished, and none knew whither. The guards who stood outside the palace were called and questioned, but no one had seen her. She had, however, run into her little den, had quickly taken off her dress, made her face and hands black again, put on the fur-mantle, and again was Allerleirauh. And now when she went into the kitchen, and was about to get to her work and sweep up the ashes, the cook said, “Leave that alone till morning, and make me the soup for the King; I, too, will go upstairs awhile, and take a look; but let no hairs fall in, or in future thou shalt have nothing to eat.” So the cook went away, and Allerleirauh made the soup for the king, and made bread soup and the best she could, and when it was ready she fetched her golden ring from her little den, and put it in the bowl in which the soup was served. When the dancing was over, the King had his soup brought and ate it, and he liked it so much that it seemed to him he had never tasted better. But when he came to the bottom of the bowl, he saw a golden ring lying, and could not conceive how it could have got there. Then he ordered the cook to appear before him. The cook was terrified when he heard the order, and said to Allerleirauh, “Thou hast certainly let a hair fall into the soup, and if thou hast, thou shalt be beaten for it.” When he came before the King the latter asked who had made the soup? The cook replied, “I made it.” But the King said, “That is not true, for it was much better than usual, and cooked differently.” He answered, “I must acknowledge that I did not make it, it was made by the rough animal.” The King said, “Go and bid it come up here.” When Allerleirauh came, the King said, “Who art thou?” “I am a poor girl who no longer has any father or mother.” He asked further, “Of what use art thou in my palace?” She answered, “I am good for nothing but to have boots thrown at my head.” He continued, “Where didst thou get the ring which was in the soup?” She answered, “I know nothing about the ring.” So the King could learn nothing, and had to send her away again. After a while, there was another festival, and then, as before, Allerleirauh begged the cook for leave to go and look on. He answered, “Yes, but come back again in half-an-hour, and make the King the bread soup which he so much likes.” Then she ran into her den, washed herself quickly, and took out of the nut the dress which was as silvery as the moon, and put it on. Then she went up and was like a princess, and the King stepped forward to meet her, and rejoiced to see her once more, and as the dance was just beginning they danced it together. But when it was ended, she again disappeared so quickly that the King could not observe where she went. She, however, sprang into her den, and once more made herself a hairy animal, and went into the kitchen to prepare the bread soup. When the cook had gone up-stairs, she fetched the little golden spinning-wheel, and put it in the bowl so that the soup covered it. Then it was taken to the King, who ate it, and liked it as much as before, and had the cook brought, who this time likewise was forced to confess that Allerleirauh had prepared the soup. Allerleirauh again came before the King, but she answered that she was good for nothing else but to have boots thrown at her head, and that she knew nothing at all about the little golden spinning-wheel. When, for the third time, the King held a festival, all happened just as it had done before. The cook said, “Faith rough-skin, thou art a witch, and always puttest something in the soup which makes it so good that the King likes it better than that which I cook,” but as she begged so hard, he let her go up at the appointed time. And now she put on the dress which shone like the stars, and thus entered the hall. Again the King danced with the beautiful maiden, and thought that she never yet had been so beautiful. And whilst she was dancing, he contrived, without her noticing it, to slip a golden ring on her finger, and he had given orders that the dance should last a very long time. When it was ended, he wanted to hold her fast by her hands, but she tore herself loose, and sprang away so quickly through the crowd that she vanished from his sight. Thereupon the marriage was solemnized, and they lived happily until their death.